Ongoing work at a Cooper Avenue warehouse that has long been rumored to become a homeless shelter has residents concerned after construction workers were suspected of illegally removing asbestos-laden tiles after hours earlier this week. Two area residents confronted a worker on site at the 78-16 Cooper Ave. warehouse, which has seen on and off work over the past several months of an unclear nature, on the evening of Jan. 14, to question the apparent removal of flooring tiles suspected of containing asbestos. The late-night exchange, captured on video and posted to a private neighborhood Facebook page the same night, comes after the Department of Environmental Protection had already issued a lifted stop work order at the site last summer due to improper asbestos removal. The recent work filmed on site, meanwhile, follows a Department of Buildings permit also issued to the owners, Wilner Realty Management LLC, last summer to convert the four-story warehouse into an office building. The Monday night video shows the worker telling the residents that the tiles were being put into a “special container,” though it remains unclear if the worker knew of the asbestos situation at the location. The online post includes images of past DOB work permits and DEP notices at the site, and directed others to contact the agencies and lodge complaints. The DOB, according to an agency spokesperson, said 13 complaints were subsequently logged via 311 alleging of unsafe construction, illegal work and unsafe asbestos removal happening at the location after the video was posted. The DOB showed up to the Cooper Avenue site the next day, and inspectors determined that the ongoing work was being lawfully completed under the office conversion permit. But the DEP, which also visited the location on Tuesday, has since placed yet another stop work order at the building until inspectors can confirm whether or not asbestos was disturbed during the work. The video and incident also reached Council Member Robert Holden, who paid a visit to the scene on Jan. 15 and said he is expecting to receive more information on the DEP’s test results soon. “I have also expressed my concerns to OSHA regarding the workers potentially being exposed to asbestos without their knowledge,” Holden said in a Facebook post. While some work now appears to be halted on the site, the incident has once more brought the topic of the warehouse’s future front and center. 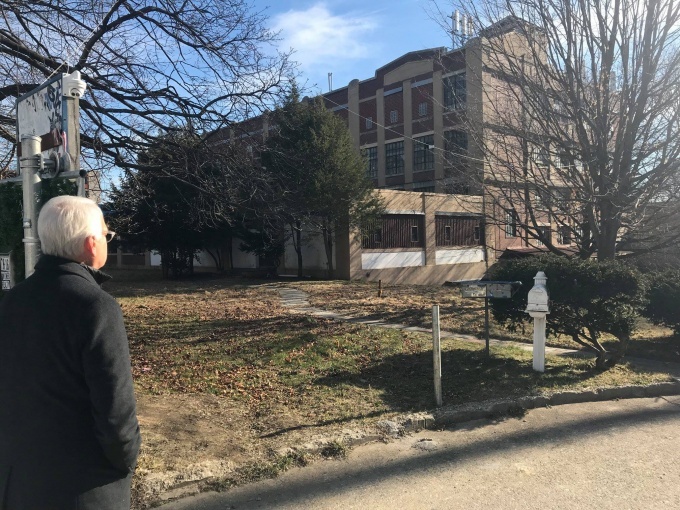 Talks surrounding the Cooper Avenue site becoming a homeless shelter have been ongoing for years, with plans either revived or dropped in between, and now seemingly in limbo. Steps toward placing a homeless shelter on the site regained momentum in the summer of 2018, the same time the DOB permits for the office building were issued, when Holden revealed that an unnamed nonprofit was in negotiations with the city to open a 200-bed men’s shelter at the location. And despite the recent work on site fitting under permits to turn the space into an office building, the developer filed an amendment to their plans that same summer which calls for the construction of a “transient lodging house”—matching the description of the proposed shelter. The DOB, however, told the Ridgewood Post that the agency has yet to review or approve the transient lodging amendment. Holden, who has aligned himself with many area residents that openly rebuked the idea of putting a shelter at the location, has spoken to his plans to turn the site into a new school instead at a Juniper Park Civic Association meeting earlier this year. How definitive Holden’s plans for the site are, meanwhile, remain unclear. Why would the city approve housing anyone in a building know to have asbestos? Don’t they have enough issues with NYCHA? They are only looking to hurt a neighborhood that doesn’t support Deblasio and they are also going to hurt the taxpayers pockets when these people start getting sick and suing. The site should be torn down and become a high school as that would be beneficial to the community, but then again when does this city care about what’s good for the taxpayers? We’re becoming a working class supporting the needs of those that don’t contribute. From closing Rikers Island, healthcare for illegals, free babysitting via 3K for all(limited to low income areas), and these multiple shelter sites Deblasio is running this city into the ground at the expensive of those trying to make a living and have a decent living. The working class needs to start protesting together as we continue to shoulder the burdens of supporting those that don’t want to help themselves.